Very popular in Ethiopian Restaurants all over the world. Its an absolute favorite of mine. Ethiopian recipes have a tendency of being hot and spicy, they are not for the faint hearted. The main ingredient in most Ethiopian recipes is a type of chili called Berbere which you prepare from a mixture of spices. Its what gives this dish that extra special kick and the beautiful color. • 1/2 kg beef, in cubes. • 2 tablespoons vegetable oil. • 1 large onion, chopped. • 2 garlic cloves, crushed. • 1 tablespoon tomato paste. • salt & black pepper. • 1 tablespoon lemon juice. • 1 teaspoon ground ginger. • 1 teaspoon ground black pepper. • 1⁄2 teaspoon ground coriander. • 1⁄2 teaspoon ground cardamom. • 1⁄4 teaspoon ground cloves. • 1⁄4 teaspoon ground mixed spices. • 1⁄8 teaspoon ground cinnamon. • 7 tablespoons mixed mild and hot paprika. For the berbere, Combine the spices and roast in a dry skillet on low heat, stirring constantly, for about 5-10 minutes, or until warm and just slightly roasted and fragrant - not browned. The proportions between hot and mild paprika powder should be adjusted to taste. I prefer 50/50, which gives a fairly hot result. While still hot, pour the berbere pepper into a jar and seal. Will keep for months in a cool and dark place. Now for the stew. Brown the meat on high heat until brown, then add the onion, and eventually the garlic and 2 tbsp. 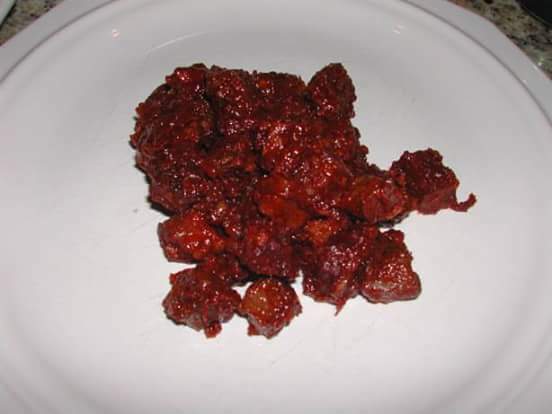 berbere, which are NOT to become burnt. Add the tomatoes, the stock cubes and the tomato paste and let simmer very slowly until the meat is tender and the stew has thickened (½ hour to 1 hour or more, depending on the meat). Add salt, pepper and lemon to taste. Garnish with coriander and serve hot on with rice or fried potatoes. You could also serve with Injera, if you can get your hands on it.